Im Jahr 2017 wird Kanada 150 Jahre alt. 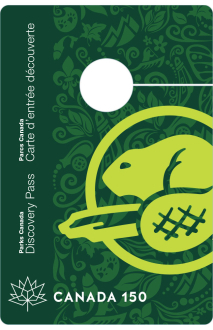 Zum Jubiläum ist der Eintritt in alle von Parks Canada betriebenen Nationalparks (Liste siehe unten) kostenlos. Über den Link kann der von 1. Januar bis 31. Dezember gültige Pass kostenlos bestellt werden (inkl. First-Class Shipping). Die Versanddauer soll gemäß FAQ ca. 3 Wochen betragen. Wir waren „leider“ 2016 vor Ort und hier zahlte man für den Discovery Pass mindestens CA$ 67.70 (Alleinreisender) bzw. CA$ 136.40 (Family Pass für max. 7 Personen). UNESCO World Heritage Site and Canada’s first National Park of Canada (1885). The „Jewel of the Gaspé“ where land meets sea. Atlantic’s sanctuary with world’s highest tides. Captivating islands representing Lake Huron’s landscape. British Columbia’s lush interior rainforest and permanent glaciers. Saskatchewan’s rare prairie grasses, dinosaur fossils, and badlands. UNESCO World Heritage Site amid Newfoundland’s wild natural beauty. Nova Scotia’s inland of historic canoe routes and portages. Yukon’s UNESCO World Heritage Site contains Canada’s highest peak. Northwest Territories‘ UNESCO World Heritage Site. Canadian Shield’s ancient landscape on Superior’s North Shore. Over 11,000 km2 of wilderness and wildlife to experience in Canada’s western high Arctic. Protected „island“ area in the Manitoba Escarpment. Canada’s first national urban park and home to an amazing combination of natural, cultural and agricultural features. Northern Yukon’s unique non-glaciated landscape.